by Caroline and Judith Horowitz with pictures by Margery Deckinger/ published 1947 by Hart Publishing Co. Even though this belonged to my mother, it featured pretty prominently in my own childhood. This was the sort of book that I loved when I was wee. One that is filled with a hundred different stories and adventures and games and fun and puzzles.... just one great big book of happy! I love the author's dedication in the front... "To all the wonderful little kids we know". "This will be a valuable experience in his development, and you will find that he will be able to talk freely in a manner which will sometimes amaze you." "These particular games will keep your children happily busy without any supervision on your part." "The Acting Songs & Poems listed on page 7 are particularly suited for recitation." 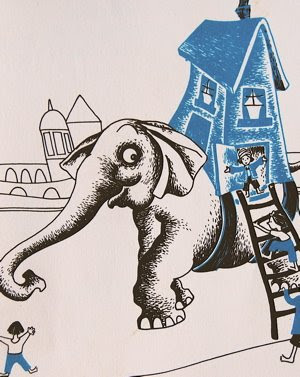 This drawing is from the story Timi and the Elephant which I remember with particular fondness. The elephant has a house on his back for goodness sake. How cool is that!?! 126 pages of awesome that end with the funniest thing ever... The Silly Sally Song.